The term itself is fairly self-explanatory. It almost seems too simple, but this industry buzzword is about continually improving your business, processes, and ways of working. In times gone by, it was often possible for companies to “rest on their laurels” and maintain the status quo with their products and services because people trusted their brands and products and knew what they were getting. However, due to the huge rise in competition, information ‘on tap’ for customers and a truly global workplace, “same old, same old” won’t work anymore. However, this doesn’t have to be seen as a bad thing. In fact, realising and accepting that there is a new way of doing business is exciting and can create many great opportunities for you and your organisation. GBS Corporate Training Ltd provides a suite of Practitioner level quality courses. By taking just two of these Practitioner-level courses, you will have completed the training requirements for being considered for Chartered Quality Practitioner Status by the CQI, now recognised as a desirable qualification for those involved in working on major projects. We also offer other process improvement courses, designed to provide your employees with the skills required for continuous improvement initiatives, including various Lean management and Six Sigma courses. Find out more about our Process Improvement courses. After World War II, new theories about quality began to be developed and implemented. Many of these ideas were brought to Japan and embraced by the country as it rebuilt in the years after the war. These ideas would ultimately change manufacturing. “Continuous improvement” was one of these ideas. The Japanese distilled the essence of this idea to a single word: “kaizen.” Kaizen means "improvement". The Kaizen strategy calls for neverending efforts for improvement involving everyone in an organisation. It is a quality philosophy that includes improvement of the product, the processes that produce them, and the way that teams carry out those processes. “Managers and organizations must have a consistency of purpose and a deep and abiding dedication to constant, ongoing improvement in order to satisfy customers, beat the competition, and retain jobs” W. Edwards Deming, Quality guru. In the Kaizen philosophy, a product or a process will likely never be “good enough.” As the name implies, the goal is to never stop improving. In the context of Lean management, continuous improvement seeks to improve every process in your company by focusing on enhancing the activities that generate the most value for your customer while removing as many waste activities as possible. In process-intensive industries, a continuous improvement programme allows individuals and groups to identify inefficiencies or 'bottlenecks'. This affords people the opportunity to streamline processes - minimising time, effort, and waste. In hardware product-centric applications, a program of continuous improvement based on customer feedback allows the manufacturer to improve the quality of the product, enhance product capabilities in subsequent products and identify opportunities to streamline manufacturing processes, thus reducing costs. In service-focused industries, continuous improvement is implemented to improve efficiency and strengthen the quality of service delivery. These companies must regularly measure customer satisfaction and observe activities in order to identify opportunities to improve results. In many software development activities and methodologies, including waterfall and agile approaches, the theory and practice of continuous improvement is inherent. For example, agile methods incorporate shorter development cycles and provide continuous customer feedback, with subsequent releases that are improved in terms of capability, quality, and performance. Better Morale: Your collaborators and employees will benefit from the improvements and increased dynamism that continuous improvement provides. Continuous improvement projects are an opportunity for employees to step outside the box and have a meaningful and rewarding impact on their job. Better Acceptance of New Ideas: When your organisation is used to accepting the status quo, new projects and opportunities can be seen in a negative light. With a continuous improvement strategy deployed, your teams will get used to and appreciate working with the notion that change is positive. Increased Motivation: When those you work with know they are empowered to observe, analyse and improve the way they work, they’re more motivated than if they’re expected to simply apply the same old methods and ways of working. They’ll be more excited about their career future when they know they can have a positive impact on it. Continuous improvement doesn’t have to be complicated, but it does take some planning and dedication on behalf of management and leadership. Making the decision to turn your workplace into a continuous improvement success story will push your business to be more effective, more streamlined and ultimately, more profitable. When you first broach the subject of continuous improvement with your employees and collaborators, most will agree in the necessity but not necessarily know where to begin. Creating a formalised plan that works for your structure is critical. 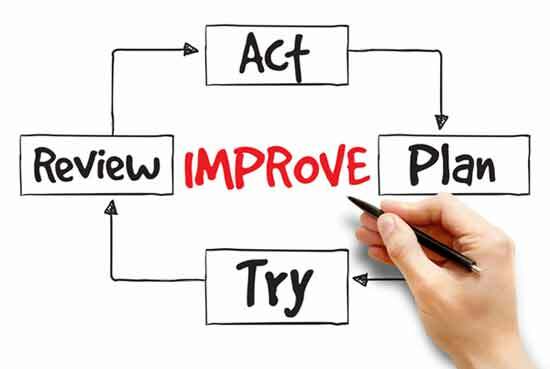 A Continuous Improvement Plan is a set of activities designed to bring gradual, ongoing improvement to products, services or processes through constant review, measurement and action. The key to success is having Managers and Leaders who are trained in managing your plan and the early phases of the product/service lifecycle, ensuring your products meets customer and stakeholder requirements and work with their teams to deploy an integrated approach to products and service quality planning. They can learn all this by taking part in training provided by GBS. Our next PT 208 Managing Quality Planning is on 5th - 7th March 2018 in London. To book your place then please call one of our training experts on 01252 618 400, or email [email protected] and we'll call you back.